NEW ROUTE FOR 2018 ST. PATRICK’S PARADE! The Fort Lauderdale St. Patrick’s Parade, presented by the Law Firm of Kelley/Uustal, will have a new route this year. The Parade will begin on Saturday, March 10 at noon its traditional starting point at Las Olas Boulevard and SE 5 Avenue. It will proceed east along Las Olas Boulevard, then turn north onto Andrews Avenue. The Parade will head north on Andrews Avenue, then turn left and culminate on SW 2 Street. This year, the colorful parade will feature more than 100 entries including decorative floats, pipe and drum corps, classic automobiles, bagpipers, marching bands, Irish dancers, street performers, scout troops, local sports teams, Veterans groups, and more. Parking is available in numerous downtown lots for a special $5 flat rate. Please see the map below. So, make your plans to arrive early, grab a great viewing spot, and enjoy the best Irish celebration in town. 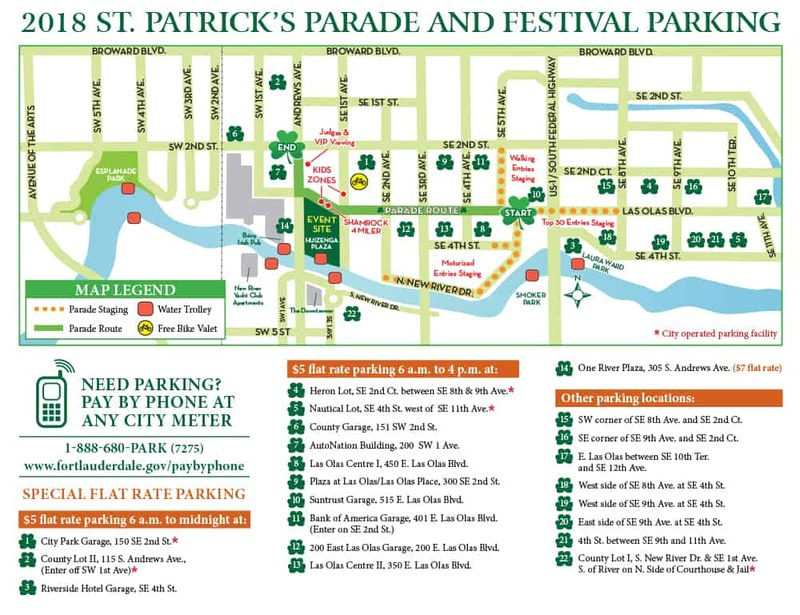 After the parade, stick around for more festivities as the St. Patrick’s Festival continues until 7:00 pm at Huizenga Plaza and along the Riverwalk. Featured performers include the Kelly Academy of Irish Dance, the Fineans, Aranmore Academy of Irish Dance, Celtic Bridge, Drake School of Irish Dance, and “U2 by UV” – the ultimate U2 tribute band. Highlights also include an expanded Kids Zone with bounce houses, gigantic slides, pony rides, a trackless train, face painting, a petting zoo, mechanical rides, and more! Plus, exhibitor booths, arts and crafts, souvenirs, and plenty of your favorite Irish food and beverages.